SBI PO Exam complete exam pattern and Syllabus 2019. There will be three tiers under this Examination. 3. Phase 3: GD and Interview Round. Selection criteria for SBI PO Main Examination After Phase 1: Category wise merit list will be drawn on the basis of the aggregate marks scored in the Preliminary Exam. There will be no sectional cut-off. Candidates numbering 10 times the numbers of vacancies (approx.) in each category will be short listed for Main Examination from the top of above merit list. Phase-II: SBI PO Main Exam: SBI PO Main Examination will contain of Objective Tests for 200 marks and after that a Descriptive Test for 50 marks. SBI will conducts both theses Objective and Descriptive Tests through online channel. Applicants will have to answer the Descriptive Test by typing on the computer. The Descriptive Test will be administered instantly after accomplishment of the Objective Test. (i) Objective Test: The SBI PO Mains objective test will be of 3 hours duration. This exam have 4 Sections containing of total 200 marks. The objective test will have separate timing for every section. 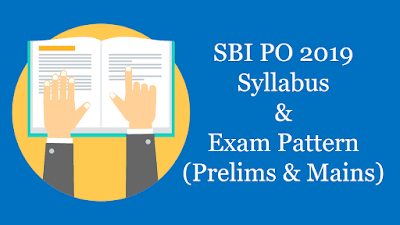 Check the table for more information related to the SBI PO Mains Exam Syllabus. Applicants qualifying for GE & Interview under 'OBC' category would be required to submit OBC certificate containing the 'Non Creamy layer' clause. Candidates who have registered themselves as OBC but do not submit OBC 'Non Creamy layer' certificate and request to be interviewed under General category will not be entertained. Final Selection: The marks attained in the Preliminary Examination (Phase-I) will not be added for making the final merit list for selection of the candidates. Only the marks attained in Main Examination (Phase-II), both in the Objective Test and the Descriptive Test, will be added to the marks obtained in GE & Interview (Phase-III) for preparing the final merit list. The applicants will have to succeed in both Phase-II and Phase-III separately. Marks secured by the applicants in the Main Examination (out of 250 marks) are converted to out of 75 marks and Group Exercises & Interview scores of candidate (out of 50 marks) are converted to out of 25 marks. The final merit list is arrived at after aggregating (out of 100) converted marks of Main Examination and Group Exercises & Interview. Selection will be made from the top merit ranked candidates in each category. Results of the applicants who qualify for Main Examination and Group Exercise & Interview as well as the final select list will be made available on the Bank's website.